• Delightfully aromatic, Coffee organic soap that leaves your body skin detoxified yet silky smooth, and wonderfully roasted coffee scented ! ► DETAILS : Start your day with a hot Coffee shower that wake you up, detoxifies your skin and leave you with a delightfull freshly roasted coffee scent. More than that, infused with coffee grains, it exfoliates dead skin cells and along with coffee essential oil as its drastic ingredient, help in the battle of cellulite fighting. Coffee essential oil is also well known for it's antioxidant, for your body, and antidepressing, for your soul, properties. COFFEE BEAN ORGANIC SOAP can invigorate and energize your body and mind while still nourish your body's skin. All ELIXIRIUM organic soaps are 100% handcrafted. Each of the formulas i use, is carefully mastered and perfected after a long trial and error process, in order to meet my standards of effectiveness, skin hydration & softness as well as wonderfull scent. All ingredients are all natural and no chemical additives are used in any step of the production process. ► BUY AS A GIFT SET : You can order the soap bar as a gift set, as the example pictured in the product photos above. The set is consisted of one soap bar, a wooden soap dish and a luffa piece with a handmade wooden sign, tied together in a beautifull little package. ► INSTRUCTIONS : Use it with hot water and enjoy it's thick aromatic foam. ► INGREDIENTS : Coffee essential oil, Castor oil, Coconut oil, Cocoa Butter, Shea Butter, Extra Virgin Olive Oil and Coffee Grains, Roasted coffee beans. This soap smells simply amazing. I haven't used it; they were Christmas gifts. I really appreciated the wax seal on the packaging - very cute. 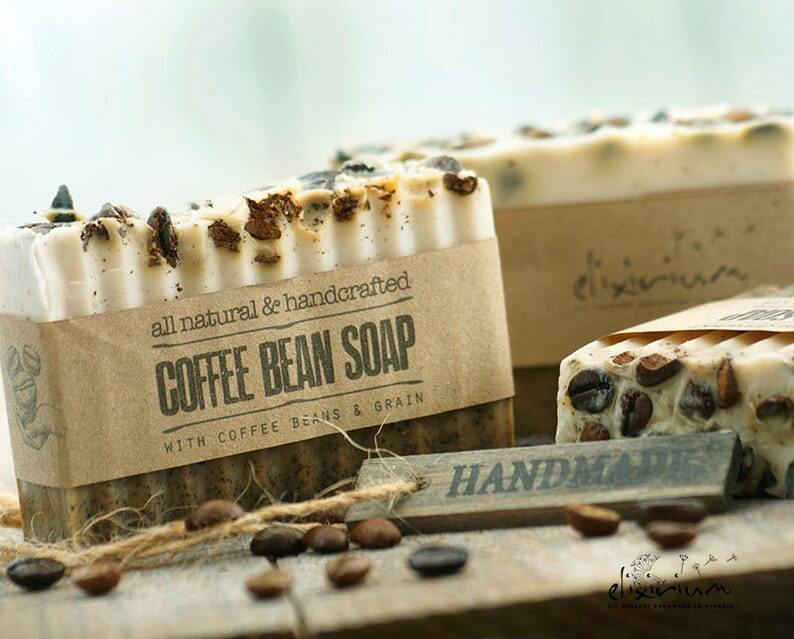 COFFEE BEAN Soap • Coffee beans infused, a rustic, vegan, handmade soap for organic skin care. 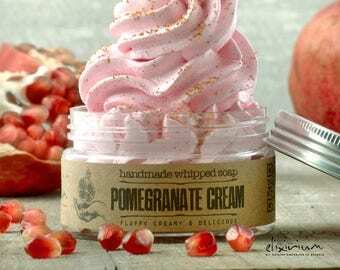 I love the creamy texture of this whipped soap! And it contains poppy seeds and sugar for a mild exfoliating as well. The scent is a refreshing and clean citrus scent from lemon and lime, so delicious:) I will definitely try more of these whipped soaps!